Chardonnay sippers have been enjoying juice from grapes grown at the Riverbench Vineyard and made by other wineries since 1973, but it wasn’t until six years ago that the family of owners started making their own wines from the 420-acre property, which sits at the far end of Foxen Canyon Road on the edge of the Santa Maria Valley. They came out of the gates with guns blazing — their branding clean and classic, their tasting room well-appointed, their grounds finely landscaped and manicured — and the chards and pinot noirs made by veteran vintner Chuck Ortman quickly turned heads. 2009 Cork Jumper Sparkling Wine: Riverbench’s first bubbly was in 2008, and this blanc de blancs is zesty and refreshing, its full foam mixing with yeasty tones in your mouth. The next release will also feature a pinot-based rosé and a slightly sweet demi-sec made of chard. 2008 Mesa Pinot Noir: Hailing from a four-acre block of Martini clone pinot on its own rootstock that sits about 10 or so feet higher than the rest of the vineyard on slightly sandier soil, this was more elegant and earthier than the estate pinot. “It’s just a dramatically different wine,” said Mohseni. 2009 One Palm Pinot Noir: Named for the singular palm that stands next to the historic ranch house that’s been restored into a tasting room and offices, this wine made us talk of the blood-flavored wines out of Burgundy. Explained Mohseni, “It’s grittier than our others.” And that’s a great thing. 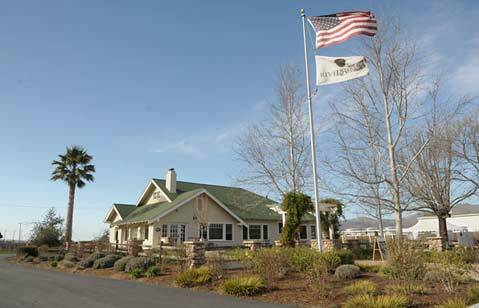 Riverbench Vineyards and Winery is located at 6020 Foxen Canyon Road. Call (805) 937-8340 or see riverbench.com.